The following words introduce every new Anglican priest to his ministry: "Therefore always remember how great a treasure is committed to your charge. For they are the sheep of Christ, which he bought with his death, and for whom he shed his blood. The Church and Congregation whom you must serve, is his bride, and his body. And if it shall happen that the same Church, or any member thereof, takes any hurt or hindrance by reason of your negligence, you know the greatness of the fault, and also the grievous judgment that will ensue. For this reason consider the purpose of your ministry towards the children of God, towards the bride and Body of Christ; and see that you never cease your labor, your care and diligence, until you have done all that lies in you, according to your bounden duty, to bring all such as are or shall be committed to your charge, into that agreement in the faith and knowledge of God, and to that ripeness and perfectness of age in Christ, that there be no place left among you, either for error in religion, or for immorality in life." (from the ACNA Ordinal) These words are at the heart of my ministry. Whenever I lose my way in the pastorate, I return to them. But how can any man fulfill such a calling? As St. Paul says: "Who is sufficient for these things?" (2 Corinthians 2:16) Certainly no one is capable in themselves. No one is able in their own strength. But even a man dependent on the Holy Spirit must make decisions with his time: "What activities will I devote myself to... in order to care for Christ's flock?" 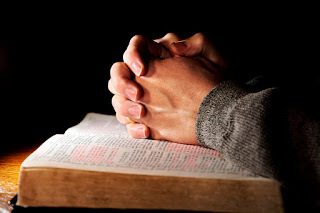 While certainly we are called to preach the Word, to teach it, to rebuke, exhort and correct with the Scriptures, today I want to talk about the pastor in prayer. There is always the temptation, as a pastor, to want to meet with everyone in the Church: to see how they're doing, to try to counsel and help everyone. But this is impossible, even in a small church. And this compulsion to meet with everyone (at least with me) is probably unhealthy anyway. The reality a pastor can touch everyone in his church through prayer. We reach more in prayer than in person. A pastor can strengthen the flock through prayer. Prayer is our most effective means of counseling, and wrestling in prayer the most serious work a pastor can do. One of my mentors once said that we should talk to God about our parishioners more than we talk TO them about God, and certainly more than we talk to anyone about them.